Exactly one year ago, my company WAC (World Armwrestling Championship Co.) prepared a tournament called Vendetta all Stars - ARMFIGHT # 46. At the same time WAL stared (World Armwrestling League. I told everyone in the office that this organization was holding the last final, and many smiled: "It can not be! After all, they have such a sponsor that they can afford to give out big money to the prize fund!" and so on. Being in our sport for 18 years, I managed to get a good look and experience more than one organizer and not one organization with rich sponsors and even greater ambitions. To be honest, I'm sorry that one more organization has ended its existence. I tell you this sincerely. And the reasons for such a final are very banal. There is someone who wants to prove to the whole world that he's cool, it takes 2-3 years and everything ends. You may ask why. Because no matter how rich you are, still your budget is not rubber, and the main component of any investment is a return of money and earnings. And there's nothing to prove! And the one, who does not understand this, falls into the pit where WAL, UAL, IPAA and others got to. It all started with a regular tournament in 2012, after a long lull appeared sponsor - a man who has huge funds, and believed that with a large prize pool and television he can become as the leaders of the famous UFC - Dana White and co-owners , and ended with the fact that the owner of WAL, it seems, left in a fool ... But someone just does his job strictly, and someone wants to please everyone and does nonsense in the style of a prize fund of half a million dollars and the like. In this case, there is no money-back system. Everyone was waiting for many sponsors as manna from the sky, but it didn’t happen. But only one person had the finances, and they just burned every day! One man comes to the trough and says: "You can be full of money to the very edge". "Oh, oh, what do you need for this?" - the trough asked. Everything is simple, give a million, and tomorrow I will return two. A trough gave out a million, and for tomorrow, instead of refunding money, the man was asked for two more! Like, give two, and four will come back... That's how some personalities spun the owner of WAL. Then it was even worse - the amount reached 10 million. We all understand perfectly, and I still realized it in 2005, that everything that happens in the US, gives a push around the world. Everything that is done in Europe, sometimes even better than in the US, is not needed by anyone in the whole world. A simple rule and a science for everyone. Well, here we are in the US, what next? The script is very difficult. In the US, people not like complex combinations, and those who have money will not give them away so simply – everything must be clear. But in the same time, people perfectly understand what a commodity is. If you sell something to someone, then the buyer should know his benefits, and no one else's problems are of interest... But arm wrestling is not yet a commodity today. In order to sell something, you need to have a strict business plan and expect everything to be a penny. Do everything to make your plan have revenue, or you will be lost with your money and plans. But in armwrestling, everything happened chaotic. In 1993, the UFC (Ultimate Fighting Championship) appeared. Unfortunately, nothing happened. The project has died, and no refund has occurred. In 2015, January 10, I visited New Orleans in the hope of meeting Steve Kaplan in person and chatting about the future of our sport. I was introduced to him by Dave Chaffee and as the president of PAL - the organizer of tournaments and armfight-duels. Apparently, Steve was not too interested in my humble person, so he never met with me. Steve is not an athlete or an amateur wrestling. He's just a businessman, and he wanted to do something special with our sport. Now I just sympathize with him, and I regret that I did not manage to meet him and communicate as a businessman with a businessman. Who knows, maybe he did not make those mistakes that I did 10-12 years ago. Maybe together we could do something more than just armwrestling. But then, at the finals in 2015, Steve gave out hundreds of thousands of dollars in the prize pool and made plans for the future and did not know that it was a step to nowhere. And in the hall where the tournament was held, on the stands stood extras and clapped on the command of the television group. And those, who were not there, will naturally say, that the picture came out good and everything was nice. But nice - it is when the picture is good and everything in the bank account is good. For that last "in the account" is the engine of the picture! 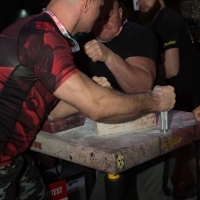 In 2013, a new armwrestling program "Game of Arms" was presented for review. After its release on one of the channels in the US, a serious discussion broke out: is this good for our sport or not? In the program, our sport was presented as a drunken entertainment, and many athletes drank alcohol during training and tournaments. Nothing to do with the sport. The idea of ​​this format was thrown by one athlete, and the sponsor was the same Steve Kaplan. After two seasons and a complete defeat, the program was taken out from the air, but again the same athlete, negotiates with Steve Kaplan about a new format called his WAL (World Armwrestling League). Play began to be large. The prize fund of fabulous sizes, the production company for incredible money and the replacement of the rules with God knows what tricks! But again someone stepped on their own rake. Athletes were left without tournaments, and sports without hope! What's next?